This monument was ordered to the Italian sculptor Carlo Rastrelli while Peter I was alive. Carlo Rastrelli is the father of the famous architect Bartolomeo Ras­trelli. This monument was supposed to be erected near the Twelve Colleges building on Vasilievsky Island. But the work took more time than it had been sup­posed to and the sculpture was finished only in 1746. The Empress Elisabeth Petrovna, the daughter of Pe­ter I, didn’t like the monument. The monument stood in the warehouse of the Founding Yard. The pedestal is decorated with bronze bas-reliefs depicting the main victories of Peter’s time: “Poltava Battle” and “The Naval Fight of Gangut”. The bronze bas-reliefs were created by the sculptor Mikhail Ko­zlovsky. In the bas-relief devoted to the battle of Polta­va, the Russian troops are depicted on the right. In the foreground Peter I stands pointing out with his sword the way to pursue the fleeing Swedes. 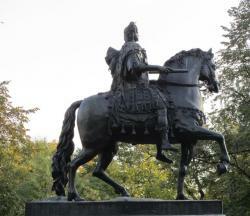 Next to the tsar is his friend and comrade-in-arms, Alexander Menshikov, who commanded the Russian cavalry. The Genius of Victory proclaims the glory of the Russian army. In the left part of the bas-relief the Swedes are shown saving their king, Charles XII. He was wounded in the leg. In the clouds, in the upper part of the bas-relief is Cancer the Crab, the sign of the Zodiac for June. The battle took place in June. On the left side of the bas-relief devoted to the bat­tle of Grangut Peter I is depicted on the flag-ship over­shadowed by the Genius of Victory. On the right side of the bas-relief the capture of a Swedish ship by the Russian forces is shown. In the clouds is Leo the Lion, the sign of the Zodiac corresponding to July. The height of the statue is 4.8m, the height of the pedestal is 7m.